Less than two weeks after a stone-faced Paul Ryan admitted defeat and declared the Affordable Care Act the “law of the land” for the “foreseeable future”, his ill-fated healthcare plan began to show sparks of life. Hopes of reviving the Republicans’ failed healthcare plan surged briefly on Tuesday when the vice-president, Mike Pence, came to Capitol Hill in an attempt to forge a new compromise that could somehow pass the House of Representatives. But the late night talks between Pence and members of competing factions of the House Republican caucus stalled and no deal was reached. A hoped-for repeal of the Affordable Care Act (ACA), also known as Obamacare, returned to the grave and recriminations began anew on Capitol Hill. In his opinion, the Freedom Caucus kept on “moving the goal posts”. Conservatives returned fire. Mo Brooks of Alabama, a member of the Freedom Caucus, noted that House Republicans had voted to totally replace the ACA in 2015 and reluctance to do anything less than that represented a flip-flop. In Brooks’s opinion, those who wanted to preserve parts of the ACA had “not only moved the goalposts, they’ve taken out the stadium, chopped ’em up and burned them”. On Wednesday, conservative groups lashed out at moderate Republicans, blaming them for derailing the latest attempt to repeal and replace the Affordable Care Act. Dan Holler, the vice-president of Heritage Action, said conservatives had already “ceded a lot of ground” on fully repealing the healthcare law. “We’re looking at ways to get our message out,” Holler said in an interview Wednesday, hinting at the possibility of running advertisements in the districts of some moderates. Conservatives remain focused on repealing the regulatory architecture of Obamacare, absent which they argue the fundamentals of the law will stay intact. An agreement, Holler said, was contingent upon “moderate members doing the things they’ve promised their constituents they would do”. 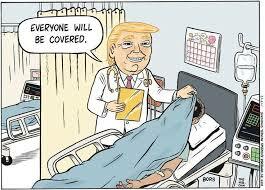 Moderate Republicans have meanwhile balked at the prospect of weakening protections for individuals with pre-existing conditions and enabling insurers to opt out of “essential health benefits” such as maternity care, mental health and substance abuse treatment and emergency services. During a briefing with reporters on Wednesday, the White House legislative affairs director, Marc Short, said there was no set timetable for a new replacement bill but said he was optimistic that Republicans from different wings of the party were finally speaking to each other. And even the ever-sunny Meadows was willing to concede that things were not looking ideal.